The 100 kilogram gold coin "Big Maple Leaf". FOUR MEN WHO went on trial in Berlin today denied involvement in the spectacular 2017 museum theft of a giant commemorative gold coin called the “Big Maple Leaf” valued at €3.75 million. Police had “presented not a single shred of firm evidence,” argued Toralf Noeding, defence lawyer for the three alleged thieves — brothers Wayci, 23, and Ahmed Remmo, 20, and their cousin Wissam Remmo, 21. Noeding also said that his clients had suffered prejudice from the broad media coverage of their extended family with roots in Lebanon, which police and prosecutors consider an organised crime group. Also in the dock and claiming innocence was 20-year-old former museum security guard Denis Umut W, the alleged inside man, accused of giving the others crucial information for the break-in. His lawyer Marcel Kelz denied media reports that the ex-guard had made major purchases, including an €11,000 gold chain, and shown interest in buying a Mercedes-Benz car and property months after the heist. Police have found no trace of the 100-kilogramme Canadian coin since the late-night heist in March 2017 from the German capital’s Bode Museum, located close to Chancellor Angela Merkel’s apartment. Prosecutors assume the nearly pure-gold treasure, which has a face value of one million Canadian dollars, was either cut up, molten down or taken abroad. Police staged raids in July 2017 involving 300 officers on premises in and around Berlin linked to the Remmo clan to gather evidence. They confiscated guns, luxury cars and more than €100,000 in cash. Investigators also used phone taps in more than 50 cases and GPS devices to track cars and searched more than 50 properties, said the defence. If found guilty of theft in the juvenile court case, the three suspected thieves — who are all registered as unemployed, and represented by two private lawyers each — would face jail terms of up to 10 years. The men, who were freed from custody before the trial, entered the court through a phalanx of some three dozen reporters and photographers and covered their faces with folders and magazines. 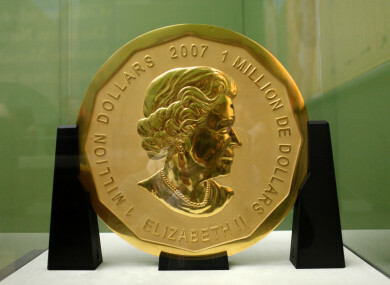 The “Big Maple Leaf”, one of five minted in 2007 with a portrait of Queen Elizabeth II, is considered the world’s second-largest gold coin after the one-tonne Australian Kangaroo issued in 2012. The coin, which has a diameter of 53 centimetres, was on loan from an unidentified collector to the Bode Museum, which describes its exhibition of coins and medals as a “chronicle of human history forged in metal”. Security camera footage from the night shows three men wearing dark hoodies, scarves and baseball caps making their way to the museum. They broke in through a window, smashed a glass case with an axe and used a rope, wooden beam and a wheelbarrow to lift the coin onto adjacent elevated urban railway tracks, said prosecutor Martina Lamb. The coin was probably damaged when the thieves dropped it twice — once on the tracks that pass by the museum and cross the Spree river, and again in Monbijou park on the opposite river bank, from where they took it away in a car. The car that police say was the getaway vehicle was later confiscated during an illegal car race, reported Spiegel Online. Unknown perpetrators at a later stage broke into a police car park and sprayed foam from a fire extinguisher inside the vehicle, possibly trying to obscure forensic traces. However, a police team discovered gold particles inside the vehicle matching the purity of the Big Maple Leaf, according to prosecutors. The suspects’ Remmo family, whose patriarchs fled war-torn Lebanon in the 1980s, is considered by police to be one of Berlin’s most notorious organised crime clans. Police last year targeted the Remmos with the seizure of 77 properties worth a total of 9.3 million euros, charging that they were purchased with the proceeds of various crimes, including a 2014 bank robbery. The head of German police union BDK, Sebastian Fiedler, said that “without doubt, clan criminality in all its facets is a prime example of completely failed integration”. Speaking to Die Welt daily, he said that the extended families produce hardened criminals with total disregard for the rule of law who “don’t accept the state under which they live”. Email “Four men go on trial for $1 million giant German coin heist”. Feedback on “Four men go on trial for $1 million giant German coin heist”.